Over 5 pounds a piece! I think with the weather a little cooler, we will stay home tomorrow and do one of our favorite things~bake! 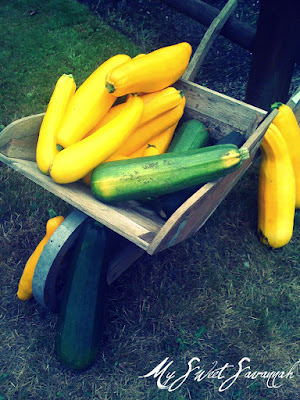 We are going to make a ton of zucchini bread and freeze it for the fall, yum! Here are a couple other recipes I would like to try out! How far are you from Issaquah WA?? We re going there in Sept to visit family. I love zucchini bread. 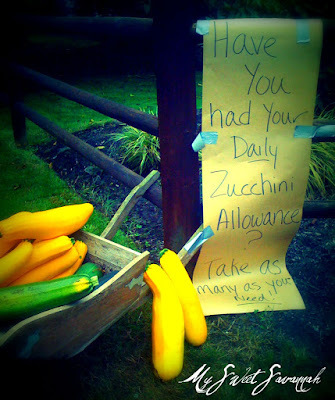 I have a bus load of squash and last night I made zucchini parmesan and it was awesome. Delicious! What great neighbors you have! Love zucchini bread. My grandmother made it all the time. My aunt makes zucchini chocolate cake and my grandma made the best zucchini relish I have ever had. Best on hotdogs. Enjoy the day. I have at lest 10 big zuc's sitting on my kitchen table..time to either find some friends in need or cook!! I love having food to gift! Oh wow. LOVE fresh veggies and free too - best neighbors ever! I just made 8 loaves last week with one gigantor zucchini. Yummy! We also highly recommend mexican lasagna with zucchini. It's totally delcious and a great veggie meal - even my husband loved it and he's not a big zucchini fan. With all that chocolate and zuchinni maybe I will be able to get my child to eat a vegetable! What a treat- Free! so jealous here! have fun and enjoy this cozy day! ps....luv your blog...it's an inspiration!! Oh, zucchini brownies! I should make those for the kiddos. Keri has told me how beautiful your home is...small world. If we are in town the weekend of the garage sale, my Mom and I will be there! I wish I could have some, to try my spiced zucchini bread. your zucchini post made me cry - serious. i live in phoenix, but grew up in chicago - the only zucchini we get here are little skinny, tiny things. oh well, all your food pics looked so delicious! i am truly jealous! ummmm....now i am so hungry and i have no zucchini boo hoo. Just how big were those zucchinis?! I try to harvest them before they get too big and seedy... but I have to admit there is nothing like watching that one "Big Boy" grow!